the canDIshhh tales: (Head) Lice Lice Baby..
Head Lice or Kuto - I've heard and read stories of how kids contract head lice. I remember watching Desperate Housewives and there was an episode that the twins had lice. They were the suspected carriers but after investigation - they were cleared, apparently - it was another child who caused the lice outbreak. In recent news, I remember reading about a PBB housemate who had head lice! When I heard of this, I almost instantly cringed! I mean, how does one contract lice? And is it possible for an individual not to be aware that he or she has lice? My imagination went on overdrive and I began to imagine lice crawling on my head and hair. I then thought to myself - it was impossible that I would contract it. A few Saturdays ago, I had lunch with my college buddies - we caught up with each other's lives and suddenly discussed on the topic of lice. My friend Shirley said that we shouldn't discount the reality that it does happen. In her experience, her househelp from the province was the carrier - thus her whole household contracted head lice, even the kids! She gave a wonderful suggestion - to have the whole household medicated for head lice - just to be safe. She does this every time she hires a new helper. But how does one medicate against lice? It was simple - by using a shampoo called Kwell. I remember when I was small, my mom had this super weird comb, she said that it was used to catch lice (kuto), so imagine my horror when I thought needed to buy one of those combs and have my helpers use them! But Shirley said there's a new way now and its so much easier! She swears by using Kwell shampoo. Good thing, its being sold in Mercury and that one use should be enough to kill a lice infestation instantly. Since I just employed a new helper, I immediately thought to buy for my whole household. As much I So right after that lunch date - my Panget and I headed to Mercury Drugstore to buy Kwell. I bought 5 pieces one for each adult in the house and 1 to be split between Kailee and Connor. The shampoo was liquidy and since I have long hair, it didn't bubble as much. My Panget said the shampoo stings, so the yayas need to be careful with the kids. That night, everyone in the house shampooed with Kwell. I honestly don't know if it was effective, but what matters is that we were able to prevent it from even happening. Based on the label at the back, one usage is good enough for 1 week worth of protection. It also says that for heavy infestation - one needs to repeat the shampooing. 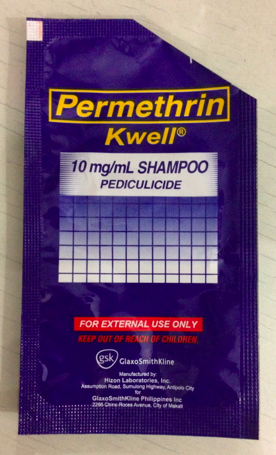 To avoid that lice outbreak at home and in school - arm yourself with this product. Remember, prevention is better than cure!! We have new helper coming. Will do this! How much is Kwell? Hi Clarice! The sachet costs P35.00 per piece. I will upload the picture so you'll know what it looks like. Thanks for dropping by!